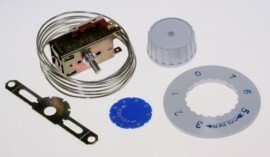 Kit Service termostat reglabil 3 contacte cu sonda de temperatura pentru congelator cu alarma, lungime tub capilar 2000mm. Interval temperatura controlata: -12°C ÷ -34°C. Cross Reference: Aeg, Ariston, Arctic, Bosch, Bauknecht, Beko, Candy, Constructa, Daewoo, Electrolux, Arcelik, Fagor, Liebherr, Lg, Gorenje, Foron, Ikea, Ignis, Hoover, Indesit, Miele, Neff, Samsung, Philips, Siemens, Savema, Whirlpool, Zanussi, Zanker VS5.